Katsuya Okada (岡田 克也, Okada Katsuya, born 14 July 1953) is a Japanese politician who was Deputy Prime Minister of Japan from January to December 2012. A member of the House of Representatives of Japan, he is the President of the Democratic Party, and previously of the Democratic Party of Japan. He also served as Secretary-General of the DPJ three times. During the DPJ's period in government he was Foreign Minister of Japan. In 2016 he remained as leader when the Democratic Party of Japan merged with the Japan Innovation Party to become the Democratic Party. Okada was born on 14 July 1953. He is the second son of Takuya Okada, who is a co-founder of AEON Group. His elder brother, Motoya Okada, is the President and CEO of AEON Group. He has a younger brother and a half-sister. A native of Yokkaichi, Mie, Okada graduated from the University of Tokyo with a degree in law, and entered the Ministry of International Trade and Industry. He also studied at Weatherhead Center for International Affairs in Harvard University. 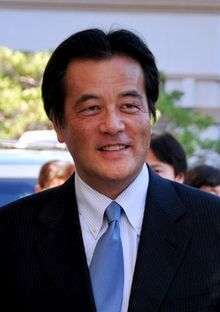 Okada ran for the House of Representatives at the 1990 general election from LDP, representing Mie Prefecture's third district, and later joined the Takeshita faction of the Liberal Democratic Party, and followed faction leaders Tsutomu Hata and Ichirō Ozawa to join the Japan Renewal Party in 1993. Through a series of splits and mergers, Okada then became a member of the New Frontier Party, Sun Party, and Minseito, finally entering the DPJ upon its merger with Minseito in 1998. He became president of the DPJ on 18 May 2004, and led the DPJ to one of its largest electoral victories in history during the 2004 House of Councillors election. However, he resigned after his party suffered dramatic losses in the September 2005 general election. Okada ran for the presidency in 2009 but lost to Yukio Hatoyama. 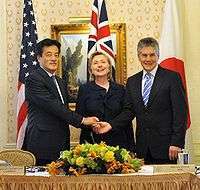 Following the success of the DPJ in the 2009 general election, Hatoyama selected Okada to be the foreign minister. Okada was regarded as a possible successor of Hatoyama when Hatoyama announced his resignation as Prime Minister and DPJ leader in June 2010, but Okada gave his support to Finance Minister Naoto Kan, who quickly emerged as the likely successor to Hatoyama. Ichirō Ozawa, however, whose resignation had also been reported announced by Hatoyama, was still supporting another less well known possible successor, Shinji Tarutoko, 50, a legislator who leads the environmental policy committee in the lower house of Parliament, a day before the DPJ leadership elections. After being selected as the new prime minister, Kan reaffirmed Okada as foreign minister. As foreign minister, Okada was one of the chief participants in negotiations with the United States (US) over the relocation of Marine Corps Air Station Futenma on Okinawa. The Foreign Ministry under Okada also confirmed the existence of a long-rumored secret pact between Japan and US which had allowed the US military to carry nuclear weapons into Japanese territory in contravention of the Treaty of Mutual Cooperation and Security between the United States and Japan. The previous administration under the LDP had denied that such a pact existed. In a September 2010 cabinet reshuffle, Okada was moved from foreign minister to secretary general of the DPJ. Okada, who is viewed as an intraparty ally of Prime Minister Naoto Kan, is believed to have been given the role of secretary general in order to secure Kan's influence in the governing party, as well as to help force the passage of government bills in parliament. Okada ran in the DPJ leadership election held in January 2015 after former president Banri Kaieda resigned after losing his seat. Okada won and returned as DPJ leader after a period of nine years. In 2016 he remained as leader when the Democratic Party of Japan merged with the Japan Innovation Party to become the Democratic Party. Following the party's defeat at the House of Councillors election in July, he announced that he would not seek re-election as leader at the party's annual meeting in September. Okada is said to be an avid collector of frog knick knacks, which decorate his office. ↑ Hatoyama starts naming Cabinet minister candidates. Mainichi Shimbun. 5 September 2009. ↑ Centrepiece: Newsletter of the Weatherhead Center for International Affairs at Harvard University. 23 (1), 2008. ↑ Koizumi Clinches Historic Election Victory. The Seoul Times. 11 September 2005. 1 2 Nishikawa, Yoko; Sieg, Linda; Roddy, Michael (5 September 2009). Key facts about Okada, to be Japan foreign minister. Reuters. ↑ "Japan’s Premier Will Quit as Approval Plummets", by Martin Fackler, The New York Times, 1 June 2010. Retrieved 2 June 2010. ↑ "Finance Chief Favored as Next Japanese Leader", by Martin Fackler, The New York Times, 3 June 2010. Retrieved 3 June 2010. 1 2 Japan Times, "Cabinet Profiles: Kan's lineup", 9 June 2010, p. 4. ↑ "Kan replaces over half of his Cabinet". Kyodo News. 17 September 2010. Retrieved 17 September 2010. ↑ "Prime minister makes bold move in shutting out Ozawa's influence". The Japan Times. 17 September 2010. Retrieved 17 September 2010. ↑ "Japan's Premier Shuffles Cabinet". The New York Times. 17 September 2010. Retrieved 17 September 2010. ↑ "Democratic Party chief Okada won't seek re-election". Japan Times. 30 July 2016. Retrieved 29 August 2016.